Also note that the decivolts value is not too precise and may be several millivolts off. Actually, some values seem to be missing either because the display reflects the measured value at the output or because the PSU simply cannot produce all values (or both). I could not get exactly zero at the output either, as the PSU would not go below 15 mV. The decivolts setting only becomes meaningful from 30 mV and up. The PeakTech 6225 A goes a little bit beyond the specified 5 amps. 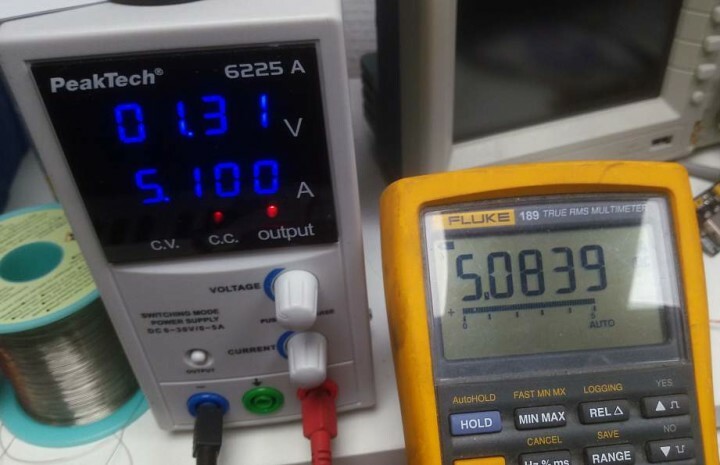 With the output starting at 1.00 V, a multimeter measuring DC volts connected to it, and adjusting volts, I obtained a perfectly linear graph all the way up to 31 volts. Indeed, that is one whole volt more than specified. Similarly, the current limiter goes up to 5.1 A, 100 mA more than promised by the manufacturer. The current limiter range only showed very slight imprecision when the values went up. Several weeks of using the PeakTech PSU 6225 A have not shown any weaknesses. To be honest, I have never pushed this PSU to its limits, but as an easy-to-use power supply with a good range and capable of supplying enough current for most of my applications it definitely does the job. This is an affordable all-round power supply suitable for most electronics hobbyists, and especially those who are tight on lab space.